Within the ESP Orders Settings, you can manage the order status. ESP Orders has two standard order statuses: Open and Closed. You can add as many additional order statuses as you like. In the Order Status section, you can edit the standard options of Open and Closed by hovering over the listing and clicking on the pencil icon. Any order status you add can be customized at any time and can also be deleted by using the trash can icon. To add a new custom order status, click on the Add an Order Status button. Note: The Open and Closed can be edited but cannot be deleted. 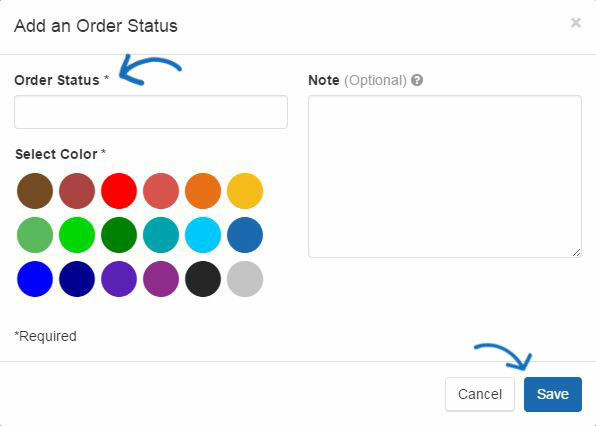 In the Add an Order Status box, enter a name for the order status and select a color. You are able to add a note detailing the status if needed.